Take advantage of 2-way text messaging and stop playing phone tag with patients. Best of all, it’s included with the Relatient patient-engagement platform. Schedule a demo to learn and see more. Two-way communication between patients and staff has never been so convenient or easy. Patients can simply reply to any automated reminder and staff will get notified in the patient chat window or via email (after 10 min). Too busy? Anyone on staff with access can view and reply to messages. No one likes playing phone tag, being put on hold, or being instantly available to whoever calls whenever they do, patients or staff. Relatient helps everyone avoid it by making 2-way texting with the office easily accessible to patients and staff. Patients can send a text message anytime, day or night, and be confident someone will see it when they have the chance. Office staff can quickly reply without dedicating their full attention or waiting for a patient to pick up the phone. 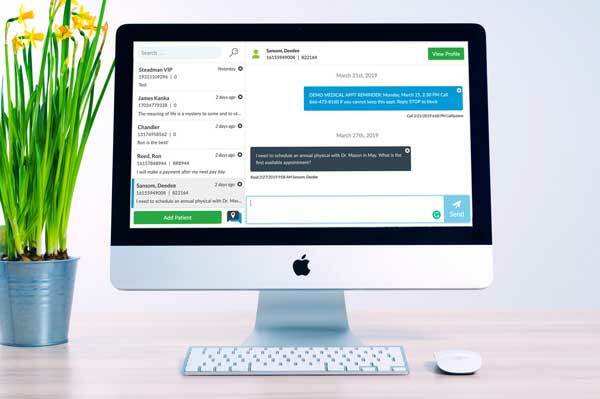 Messenger works across the Relatient platform tying together Appointment Reminders, Demand Messaging, Surveys, Patient Self-Scheduling, eRegistration and Health Campaigns with 2-way texting messages. The tool easily manages these communications along the patient journey enabling conversations the way patients want. Patients respond more quickly and at higher rates, in the 30-40% range, saving everyone time and reducing inconvenience.